Washington, D.C. just isn't our nation's capital. It's a symbol of all the freedoms and ideals that make America, well...America. It's history, politics, and a study of the human spirit all shoved into its tiny borders. Oh, and its bursting with ghosts! My favorite of these ghost stories is a little different than the classic spooky tales of deceased presidents roaming the halls of the White House offering advice to anyone who will listen. This is a tale of a Demon. Well, a Demon CAT! The Demon Cat, affectionately and cleverly nicknamed D.C., has been terrorizing security guards in the nation's capitol ever since the early 1800s! It is believed that the phantom feline originates from a living, breathing cat that served its country many, many years ago. Evidently, not long after the White House and surrounding buildings were built, Washington, D.C. had a problem. The basement tunnels under the city were plagued with rats! Cats were brought in to take care of the problem, but one cat remained long after the rest had wandered away or were adopted: The Demon Cat of Washington, D.C.
To witnesses, the Demon Cat initially appears as a normal cat, often even being described as a helpless kitten. However, as they approach the cat, its eyes begin to glow a sinister shade of red. The tiny kitten grows to the size of a regular house cat, then to the size of a large dog, and then continues to grow until its the size of a lion, tiger, or by some accounts, even a bear! Those who are lucky will witness the cat simply disappear into thin air. Others aren't so lucky, and will feel a paralyzing fear as the creature lunges at them, only to disappear mid-air. In any event, the creature is only said to show itself to those who are walking alone. Twice, once in 1862 and again in 1898, the cat was shot at and at least one person is said to have died as a direct result from contact...dying of a heart attack allegedly brought on by fright. There's no limit to the Demon Cat's area of prowess. It is seen both above ground and in the basement tunnels of various government buildings, but it does tend to favor a specific area...a pretty creepy area in its own right. When a deserving person dies and lies in state at the Capitol Rotunda, the casket is placed on a pedestal base known as catafalque. 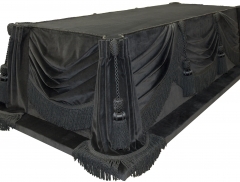 The present catafalque dates back to the hastily constructed platform used in the funeral of Abraham Lincoln, and aside from a few adjustments, is basically the same as it was nearly 150 years ago. When not in use, it is stored in an area below known as the Catafalque Storage Room, a crypt that was originally supposed to be the final resting place of George Washington. And while the Demon Cat seems to freely roam for the most part, he's usually only seen only during specific times. Reports of the cat have taken place around the time that a new president is elected into the White House, but more spookily, the Demon Cat seems to be an omen of great tragedy befalling America. Allegedly, the cat has been seen before the deaths of Abraham Lincoln, FDR, and JFK. He's been seen before the stock market crash of 1929 and even on the eve of September 11th. The last "official" sighting took place prior to the 1940s, though. That's because during that decade, an "official" explanation was given. Basically what they were saying was that former security guards had a long history of being drunkards...and that in one specific incident, a drunken guard was lying down on the job, got licked by a normal cat, and since he THOUGHT he was standing up at the time, overestimated the cat's size! 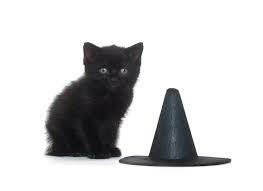 Due to this hilarious accusation and the tightening security protocols, guards stopped reporting sightings of the demon cat, and today, the newest stories are only coming from retired personnel.